These four black and white photographs show a view of the Kansas State Office Building in Topeka, Kansas. 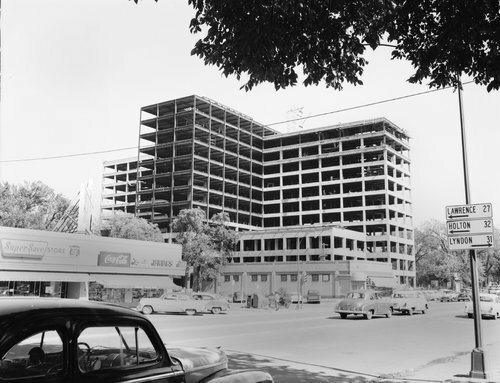 Construction on the twelve-story building, located at the corner of Tenth Street and Topeka Boulevard, began on October 26, 1954 when Governor Edward Arn in a public ceremony broke ground for the future office site. The steel frame structure with its 1,986 tinted glass windows was completed at a cost of 9 million dollars in March of 1957. For a number of years, the building was known as the Kansas State Office Building until January 9, 1987 when Governor John Carlin renamed the facility to honor the memory of former Kansas Governor Robert B. Docking. In May of 2014 a budget bill passes in the legislature for the authorization to raze the building.